Economically, it’s a challenging time for most Nigerians, and factors like the current exchange rate, almost zero power supply and very deplorable infrastructure, which make survival and business operations even more challenging to the average business owner, are demotivating enough to keep any young Nigerian from choosing to swim upstream. Meanwhile, a greater percentage of Nigerian business owners have no access to governmental support, startup grants or financial aid whatsoever. Nevertheless, there are thousands of die-hard Nigerians who are still keeping their heads above the waters, thereby proving to the rest of us that thriving in our economy and at a time like this, is both feasible and possible regardless. A while ago, we came across (another) one of these strong and enterprising Nigerians, and we believe her story will be an inspiration. 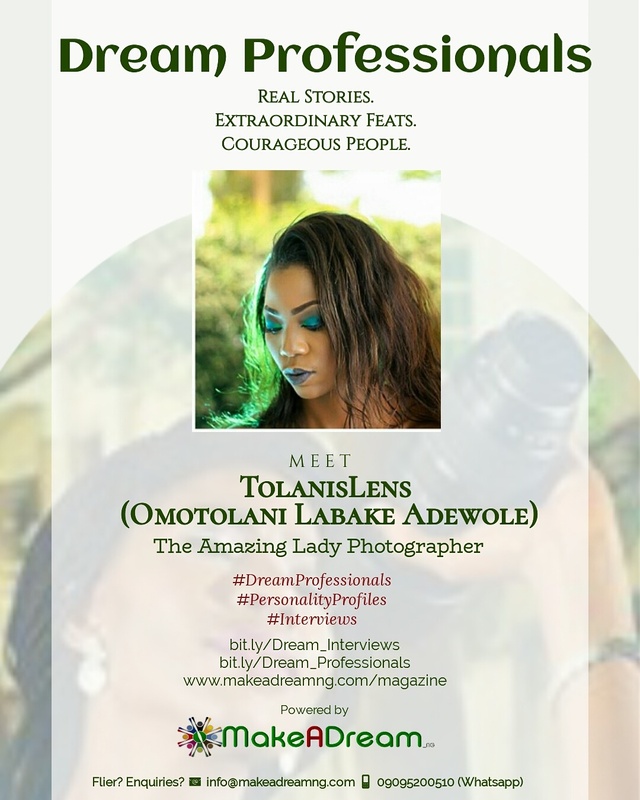 Without further ado, let’s meet Omotolani Labake Adewole, the amazing Lady Photographer, and another TY Bello in the making… as interviewed by Funmi Adebayo. Tolani: I am Adewole Eunice Tolani, A God lover and chaser , the fifth child in the family of nine from Osun state, Ile-Ife to be precise. I was born and raised in Ilorin, Kwara State. I am a graduate of Computer Science from Kwara State Polytechnic. 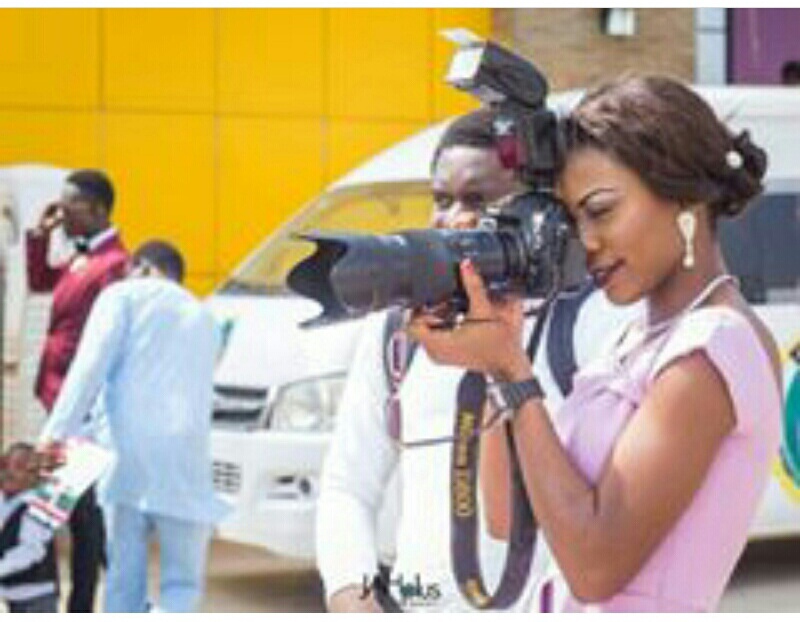 Funmi: So, how did you become a Photographer? Whose inspiration or what event triggered it? Tolani: I’ve always loved pictures, but I prefered to be the model…[smiles]. My interest in photography started in 2012, when I got my first job after NYSC, at a photography studio in Lagos State as a Front Desk Personnel and a Makeup Artist. When my boss then, (Oyedapo Oyenuga of CODED CONCEPT) saw my interest in his field, he began to train me. He also gave me tutorials to learn from. Shortly after, I had to relocate, but my training didn’t end there, as my cousin introduced me to a photographer friend of his, and that was how my journey into photography started. God miraculously gave me my first professional camera through a friend who believed in me. I covered my first event, a wedding ceremony on the 25th of May 2014. Funmi: Wow! A special date indeed. So your inspiration? Tolani: My first inspiration was my boss, I watched him take different shots, and saw how he creatively put things together, then I said to myself, “this seems more interesting than being in front of the camera!” Also the women in the industry make me know that my gender is not a limitation because if they, being women, wives and mothers can do it, then I can also. Funmi: Interesting, so tell us about your peak moment so far. Tolani: My happiest moment was when I was privileged to cover a National Program graced by the wife of the Vice-president, Mrs. Dolapo Osibanjo and other dignitaries. That was in 2016. Funmi: So what about your lowest point in the career when you did quit or almost quit? Tolani: The major challenge I had in the beginning was consistent cash flow. There were no paying clients for months, and as expected, people around just wanted free jobs. Meanwhile, there were bills to pay. That statement, though funny, struck me because really, I had done a lot of stuffs in the past, and I always quitted at the slightest challenge. In any case, leaving photography was not an option this time, even if there was no money coming in yet because I’d falling so deeply in love with photography that I couldn’t even think of any other thing to do. Funmi: So how did you get out of that stage, and how do you get back up at times like that? This scripture gives me strength and reminds me that God has got my back. I mentioned earlier that I am a ‘Jesus-baby’. His word keeps me going (smiles). Also, practically now, I’ve learnt to talk to the right people. I seek counsel and solace from people who believe in me and they help me through whatever is keeping me down. Funmi: So inspiring. So, how can people order your service? Tolani: That’s very simple. To order my services, please contact me via my instagram page and handle @tolanislens. You can send me a DM, and all my contact details are stated in my bio. We are available to cover your events anywhere, so you can order from anywhere in the world. Tolani: Never allow your gender, age, size, status, what you don’t have yet or the nation’s economy to limit you. Have and connect with an underlying purpose and learn to enjoy what you love. And above all, have a picture of the future in your mind, as that will keep you going in tough times. I celebrate You. Thank you. To order my services, please contact me via my instagram page and handle @tolanislens. You can send me a DM, and all my contact details are stated in my bio. We are available to cover your events anywhere, so you can order from anywhere in the world. So are you a startup, author, talent or a professional? Have you done something phenomenal? It’s time to stop blinking in the dark. Talk to us today and Let’s tell your story to the world. Phone: 09095200510 (Whatsapp or SMS if line is busy or not available). You can also follow and DM us via our instagram handle @makeadream_ng.